Custom, edge-lit Elume LED Light Panels uniformly illuminate any translucent material to create eye capturing architectural highlights and features. retail products and create brilliant, unique consumer environments. Available in Warm White, Neutral White, Daylight White or RGB our edge lit optical acrylic sheets are custom manufactured specific to the dimensions and/or shapes that your project requires ensuring the most vibrant and uniform output optimized for backlighting your translucent material. We invite you to contact us to discuss your project's LED Light Panel requirements with one of our knowledgeable design associates. Illuminate any translucent material to produce bright, uniform backlit and vibrant, sustainable architectural features or illuminated graphics and signage. Every eLume LED Light Panel is custom manufactured to the dimensions/shape, light level and kelvin temperature or RGB output to each client's specific project's requirements. With multiple fully dimmable output level options and the ability to embedd LEDs along 1, 2, 3 or all 4 edges of the acrylic, our panels are fabricated to the ideal light level required for your backlit application. 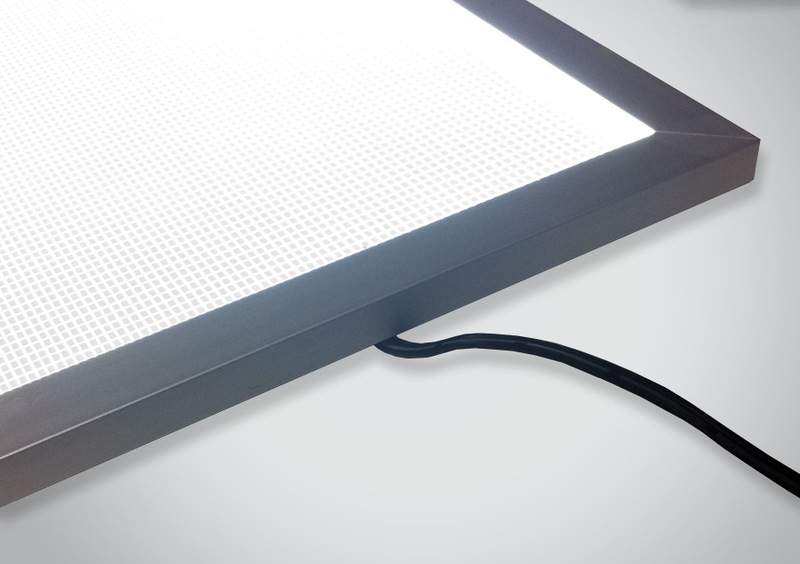 Meticulous fabrication process coupled with stringent quality control measures and UL safety certification ensures your eLume LED light panel arrives as expected and outperforms your expectations throughout the LED panel's longevity. 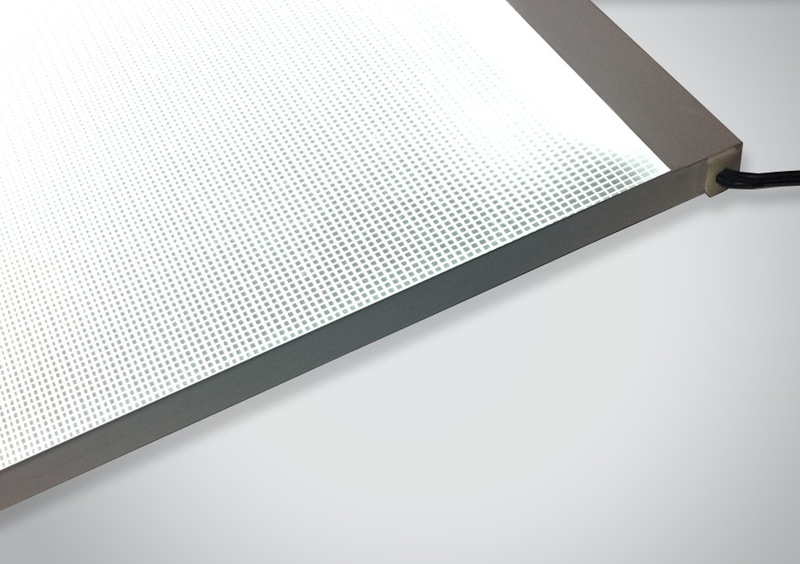 With their solid-state circuitry LEDs embedded in a light distribution matrix engraved, optical acrylic sheet, our eLume LED panels are water resistant, impervious to vibration and impact resilient. From concept to implementation, architects to end users, our knowledgeable design consultants and technicians offer assistance throughout the project to meet your functional requirements and achieve your aesthetic lighting objective. To ensure the ideal output specifications for your project each LED light Panel is custom fabricated with the option of embedding LEDs along 1 edge, 2 opposing edges or along all 4 edges. 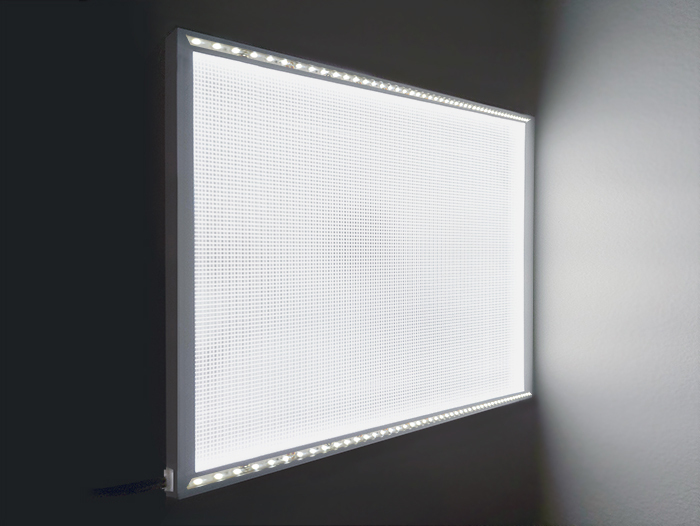 Each LED Light Panel's light distribution grid matrix is optimized by Elumanation's proprietary algorithm to ensure maximum uniformity across each light panel's surface. LEDs embedded along ONE edge. 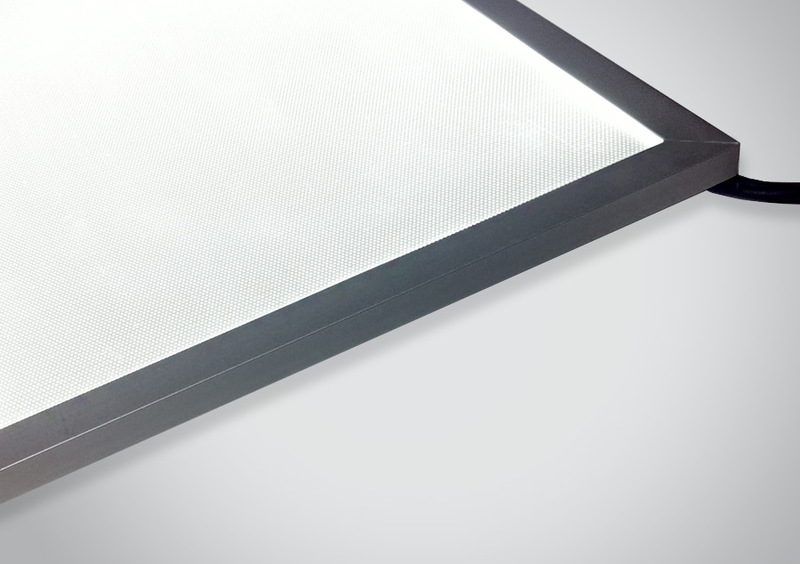 To eliminate the slight drop off associated with larger panels and LEDs embedded along ONE edge we typically only recommend light panels with LEDs embedded along ONE edge for panels 14 inches (355 mm) or less in width to ensure uniform illumination. PLEASE NOTE: LEDs shown in the image are for demonstration purposes only and are not visible on the final product. LEDs embedded along TWO edges. 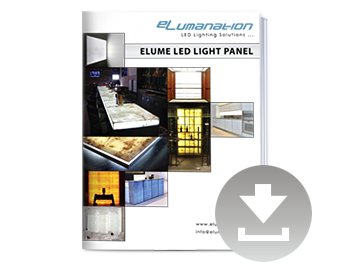 For larger light panels, LEDs embedded along TWO opposing edges coupled with Elumanation's proprietary light guide distribution grid optimization algorithm specific to every Elume LED Light Panel ensures maximum uniformity with superior illumination levels. LEDs embedded along ALL FOUR edges. For larger panels square or near square in shape, LEDs embedded along ALL FOUR edges coupled with our proprietary light guide distribution grid optimization algorithm specific to every Elume LED light panel ensures maximum uniformity with superior illumination levels. Thin, frameless 8mm [0.31"] units with the abillity to be cut in various shapes combined with the option of extending the light matrix grid to the non LED edges without a front masking tape to minimize the appearance of butting multiple units ideal for unique shapes, seamless multiple panel arrangements or controllable RGB. Thin, right angled, 8mm [0.31"] framed units and perimeter embedded LEDs edge lighting 3mm [0.12"] optical acrylic ensures lightweight luminaires coupled with the further uniformity of a tight dot matrix pattern ideal for backlighting graphics and signage. Thin, right angled, 10 mm [0.39"] reinforced framed units and perimeter embedded extreme output LEDs edge lighting 4mm [0.16"] optical acrylic ensures lightweight luminaires of the highest industry output with the added benefit of the frames rigidity ideal for larger scale single units or achieving maximum illumination levels.